Valberg is located between Guillaumes, at the top of the Gorges de Daluis to the west, and Beuil, at the top of the Gorges du Cians to the east. Officially, Valberg is located half in the commune of Guillaumes, and half in the commune of Péone, a tiny village 8 km northwest. Officially, Valberg is located half in the commune of Guillaumes, and half in the commune of Péone, a tiny village 8 km northwest. 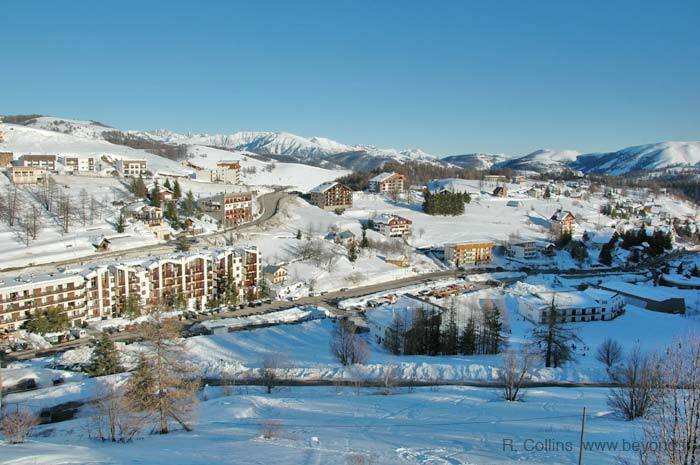 Valberg is a true ski village, 90 percent abandonded in the summer: there are a few apartments and some surrounding villas occupied for the great mountain air and hiking in the summer. There's wonderful hiking around Valberg, with many half-day and day loop hikes available, and enough connecting trails that you can continue indefinitely. The GR5-GR52 grande randonée passes northeast of Valberg, from Auron to Roure and St Sauveur-sur-Tinée [GR5-GR52 map]. An alternate route, though, the GR52 comes south from Auron and Roya, through Péone and Valberg, then goes east through Beuil and Roubion to again join the main GR5-GR52 trail. There is a bus between the Nice town and airport to the Valberg ski station. It takes 2 hours (86 km) and costs 1 euro. The drive from Nice to Valberg is 85 km, about 1 hour 30 minutes. The route is north on the D6202 (the old N202) from near the airport (direction Digne-les-Bains). North past St Martin-du-Var and Plan-de-Var. At the junction with the Tinée Valley, stay on the D6202, northwest, via Touet-sur-Var. Just past Touet, turn right onto the D28, Gorges du Cians. It's 22 km north on a good road to Beuil, then left and 7 km to Valberg. There is an alternate route, up the Tinée Valley to St Sauveur-sur-Tinée, then west past Roubion to Beuil. This is a beautiful drive, but the road is narrow and very twisty, and more likely to be closed some times during the winter.